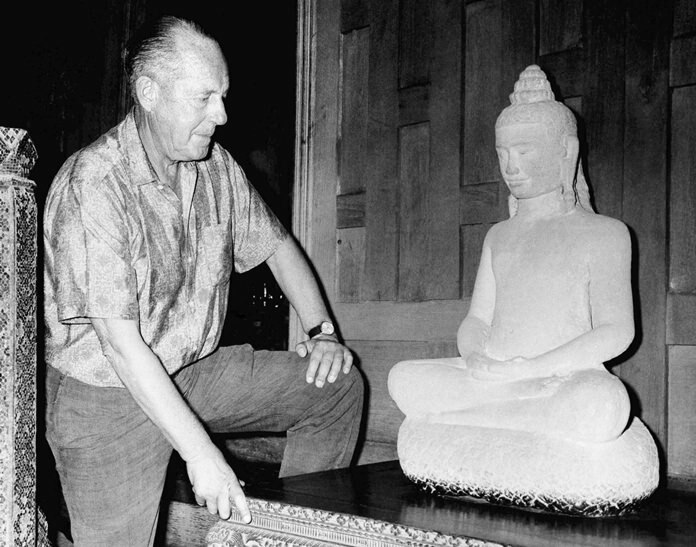 Bangkok (AP) – A new documentary is set to stir fresh debate over one of Asia’s most enduring mysteries: What happened to Jim Thompson, Thailand’s legendary silk king. The former American intelligence officer turned textile tycoon went for a walk in the Malaysian jungle 50 years ago and never returned. Despite a massive search, no trace of Thompson was ever found. One of the most prominent Westerners in Asia had simply vanished. Theories abound: He was killed by a tiger; he got lost and perished in deep forest; he disappeared himself as part of a political intrigue. Those behind the documentary say they have new evidence that Thompson was killed. Their film, “Who Killed Jim Thompson,” premiered Oct. 20 at the Eugene International Film Festival in the U.S. state of Oregon. “There’s been all sorts of theories and mostly silly theories, but I’m hoping that this will put some closure to, you know, the whole story,” said Barry Broman, the film’s producer. The filmmakers, from Adventure Film Productions, said they got their break out of the blue: An old contact approached them with a tale of a death-bed confession. They eventually found a second source whose information dove-tailed with the first. Their conclusion: Thompson was slain by rebels from the Communist Party of Malaya who grew suspicious after he arrived in the jungle and began requesting a meeting with the party’s secretary-general, at the time Malaysia’s most-wanted man. Rather than vacationing, the filmmakers said, Thompson was on what turned out to be a final, fatal mission. The filmmakers acknowledged the murder theory’s not new, but they believe their version is more substantial. While some of the film’s conclusions are plausible based on what is known about Thompson’s life, there is nothing definitive given that it relies on second-hand information from relatives of those allegedly involved and leaves many questions unanswered. During World War II, Thompson was a highly decorated operative with the Office of Strategic Services, the forerunner of the CIA. After the war, he was stationed in Thailand with the OSS and chose to make his home there after turning businessman and founding his silk firm in 1948. Thompson helped revive the Thai silk industry and his company has since grown into one of Thailand’s flag-ship luxury brands. His former Bangkok home, once the site of legendary parties, is now a museum filled with his fabulous collection of Asian art and antiques. Both have become must-see attractions for the millions of tourists who visit Thailand each year. The company declined to comment on the new claims about the fate of its founder. Thompson had a $1.5 million a year business by 1967, when the Vietnam War was in full swing with Thailand playing an essential role, hosting bases from which the U.S. Air Force bombed communist-controlled areas of Indochina. Thompson decamped in March of that year to Malaysia’s Cameron Highlands, a hill station dotted with tea plantations that was once popular with British colonists, for some rest and relaxation with Singaporean friends at their Tudor-style Moonlight Cottage vacation home. On March 26, Easter Sunday, as his hosts were taking a rest, they heard their guest from Bangkok leave the house, presumably to take a stroll in the area’s crisp fresh air. Not a trace of Thompson was found after that. Hundreds of people were involved in the initial sweep to find him: soldiers, police, professional jungle trackers, native tribespeople. When no clues were unearthed, psychics and medicine men joined the fruitless quest.